Literature is better with beer. That listening to great writing while sipping great beer could make both experiences better. 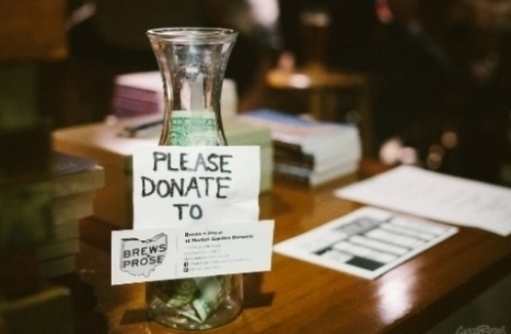 Brews + Prose was founded in the summer of 2012 with this idea in mind and six years later our mission has grown to showcase America's great authors to Cleveland and to showcase Cleveland to America's great authors. We want you to join us. Readings are held the first Tuesday of every month at 7:00 p.m. in the beautiful Ohio City Room at Market Garden Brewery located at 1947 W 25th St, Cleveland, OH 44113. And when you buy a book, you'll receive a free beer. Salvatore Scibona's first novel, The End, was a finalist for the National Book Award and winner of the Young Lions Fiction Award. His work has won a Guggenheim Fellowship, a Pushcart Prize, an O. Henry Award, and a Whiting Award; and the New Yorker named him one of its "20 Under 40" fiction writers. He is the Sue Ann and John Weinberg Director of the Cullman Center for Scholars and Writers at the New York Public Library. Halle Butler is a writer from the Midwest. Her first novel, Jillian, is a brief account of a medical secretary's drunken social blunders and callous treatment of her co-worker. Her second novel, The New Me, is a brief account of a depressed temp worker. She is a Granta Best Young American Novelist, and a National Book Foundation "5 Under 35" Honoree. Want to learn more? Make a donation? Series founder Dave Lucas receives a 2016 cleveland arts prize.